To Create this page layout with old photos which are turning yellow you will need to mat them with a background color. Make sure that the colored paper that you use does not make the pictures look more yellow. With the photos above I did use a light yellow paper but it is not directly behind the photos. I used a brown to offset the color first then I placed the light yellow paper behind the brown. I grouped the three smaller photos together making sure they were the same size. Then I place the larger photo in the center. This way when looking at the page your focus is on the larger photo. 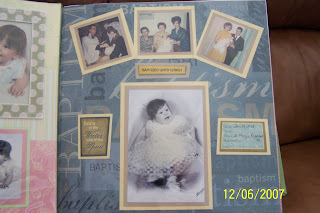 The background page is busy with Baptism verbiage, anytime you have a busy background you might want to mat the photos and put the focus on the photos instead internally on the paper. Only two embellishments I felt were needed on this page. These embellishments include the date, place of the event. Also the God Parents name can be included. Using a few embellishments can create more focus on the photos instead of having such a busy page that your eyes do not focus on anything in particular. Your eyes should flow across a page with ease enjoying the photos and being able to read the information about the layout. I hope you enjoy this description on how to layout old photos.